Even if your feet don’t hurt, they may be a major factor contributing to your health problems. Do you stand or walk on hard surfaces for more than 4 hours daily? Do you participate regularly in any physical sport (basketball, baseball, tennis, golf, bowling, etc.)? Are you age 40 or over? Have you had a prior injury to your knee, back or neck? Do your shoes wear unevenly? Do you have joint pain while standing, walking or running? Is one of your legs shorter than the other? Do you have knock knees or bow legs? If any of the above pertain to you, custom fitted orthotics could help. 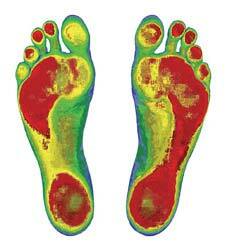 Even if your feet don’t hurt, they may be a major factor contributing to your health problems. Spinal/pelvic misalignment is often the culprit. The TOG GaitScan™ is an innovative diagnostic tool and digital casting device that allows practitioners to analyze patient biomechanics and order custom orthotic products. With 4096 sensors and a scan rate of 300 frames per second, GaitScan™ is the industry leader in dynamic scanning capabilities. What does this mean for you? A new, in depth method of assessing your gait cycle with a dynamic scan gives your health care provider access to a wealth of information that cannot be obtained with the naked eye. Over a million points of data are recorded, tracking minor flaws in your biomechanics and shedding light on issues that if left untreated, could develop into painful conditions over time. The TOG GaitScan™ is a valuable education tool that provides practitioners with a comprehensive, biomechanical analysis for each patient as well as clear, concise images to assess and articulate the need for orthotic therapy. A perfect fit is achieved and is usually back in our office within 10 working days. These are posture correcting orthotics, designed to meet your individual postural needs. Modification, refund, credit or exchange – up to 1 year from the date of purchase.